Just minutes north of Orlando Florida attractions, Seminole County is experiencing a cultural and entrepreneurial resurgence. Called Orlando North by those in the know, it offers “an easier, wilder way to do Orlando” with “pristine nature parks, less crowded restaurants and more affordable hotels.” We spent several days touring Seminole County meeting business owners. Here is a list of Seminole County Tourism’s favorite food, fun and entertainment and our notes on Orlando North. Cross-Seminole Trail hiking, part of the Florida National Scenic Trail, in Lake Mary. The trails provide access to picnic tables, water fountains, sports fields, and restrooms. The 14-mile Seminole-Wekiva Trail, which includes Altamonte Springs, Longwood, Lake Mary and Sanford, is a rail trail that runs alongside the tracks of Florida’s old Orange Beltway Railway, at one time the longest railroad in the country. So check your tire pressure, put on your helmet, and pedal your way through Orlando North, Seminole County. We spent several days touring Seminole County meeting business owners. In addition to all the quality entertainment and outside recreation options, this community is filled with delicious food and breweries. We visited Vinzo's Italian Grill and Pizzeria in Casselberry, Florida and enjoyed one of the best Italian meals we have had anywhere. We asked owner Vinny Essa about his restaurant. “Our philosophy is simple: Use exceptional quality ingredients combine it with traditional culinary skills (old time cooking techniques) and you will produce an amazing product. We have a mixture of our unique creations plus our intake on traditional Italian entrees. We believe listening to customers and following trends help create most of our hit dishes,” Essa told us. The Townhouse is truly an Ovideo tradition. They have been serving up good food and good times since the 1950's with a family owned and operated philosophy of "great food at fair prices." they like to say that they are where Oviedo meets to eat!! We spoke with owner Leigh-Ann Tepper as we enjoyed a delicious breakfast with District 2 Commissioner John Horan. "We have a lot of loyal customers. Most eat here at least once a week. Some are here three times a week." The Townhouse is located at 139 N Central Avenue, Oviedo, Florida. For more information, visit http://www.oviedotownhouse.com or phone 407-365-5151. The Tennessee Truffle serves delicious southern breakfast and lunch. The décor is a delight with a kitchen that resembles a tin roof building. The dining area has red brick walls, booths, tables, bar stools and even a church pew. His Chocolate Gravy Biscuit is incredible! Lonnie's Fusion Cuisine opened in October of 2012. Owned and operated by Chef Lonnie and his wife Christina. 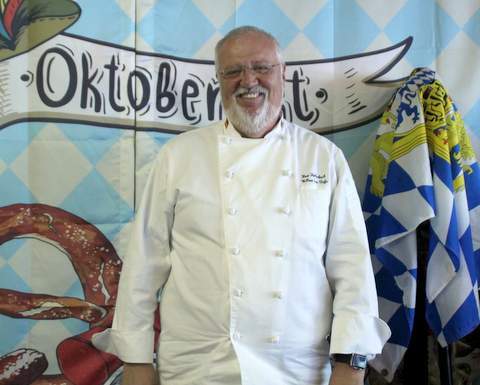 Chef Lonnie loves mixing flavors from other cultures and fusing them with American Cuisine. All Lonnie's all meals are prepared to order to provide you with the best meal possible. "I'm here to knock your socks off," Chef Lonnie told us. "Our specialty is seafood and my wife creates desserts. I like French and Caribbean and Asian influences on fresh seafood." 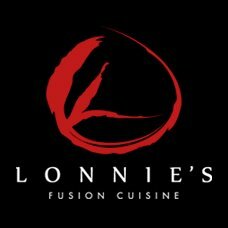 Lonnie's Fusion Cuisine is located at 124 N 4th St Ste 1700, Lake Mary, Florida. For more information, visit http://www.lonniesfusioncuisine.com/ or phone 407-878-5804. The Smiling Bison never intended to offer bison on the menu! It was named after owner Josh Oakley’s hometown of Buffalo, New York. Even though serving bison wasn’t the original plan, they do serve an outstanding 1/3 pound bison burger. Crepevine founder Serge Osaulenko developed a love for crepes during a six week visit to Greece. We are glad he did. His Munchy Crunchy (banana, yogurt, almonds, granola, dried cranberry, honey) and Sweet Tooth (banana, fresh strawberries, nutella, peanut butter) are fantastic. We joined Theo Hollerbach for lunch at his popular Hollerbach's and we enjoyed a variety of German foods. “It’s comfort food to me. It’s just good home cooking,” he said. Theo is a lot of fun! Here’s a little bit of what he told us. Their 240 seat taproom is decorated with “nostalgic remembrances, geek culture, and the work of local artists.” Table top and console games are offered for free play and they host live music and comedy nights. 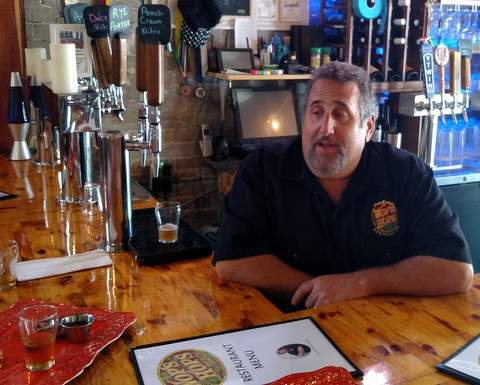 Wop’s Hops Brewing Company is Sanford’s first microbrewery. It is located in historic downtown Sanford in the landmark Stokes Fish Market building. Wop’s Hops Brewing Company offers fine craft ales, a selection of wines, sodas and dog-friendly beer garden. 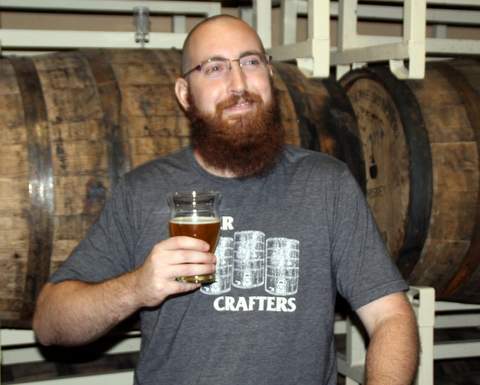 “It’s fun to be part of the craft beer scene in Florida. I approach brewing beer the way a chef approaches a fine meal. 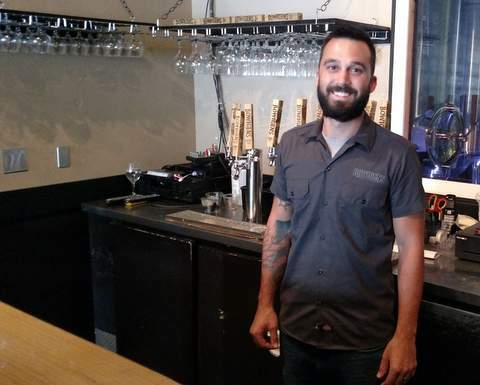 It has a lot of art to it,” co-owner Greg Piecora told us. Bowigens is a mixture of the owner’s (Kevin Wigen and Bobby Bowen) last names. Bowigens Beer Company began when musicians and long-time friends Kevin Wigen and Bobby Bowen turned their love for brewing beer into a business. Wigen and Bowen rely on a strong balance between art and science and pride themselves on being artistic brewers. “Most of the time, you are drinking beer that is 24 hours old. Every beer goes into a specific glass that accentuates the flavor. We feel like we’re helping educate people about beer,” Bowen told us. 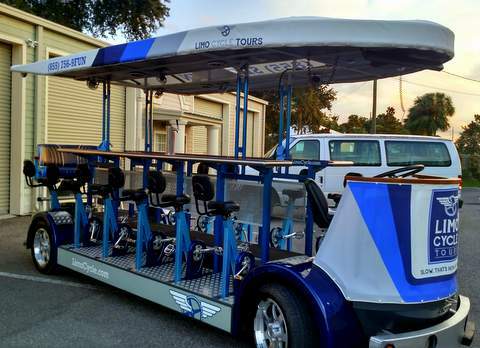 Tour Sanford, Florida on a pedal powered bar! Even though drinking and driving is thankfully illegal, drinking and pedaling is not…when you are on a Limo Cycle Tour in Sanford, Florida. We enjoyed a Limo Cycle Tour and spoke with Managing Partner Steve Tishman. “Limo Cycle is an eco-friendly, pedal-powered, team building, pub crawling, birthday celebrating, bachelorette partying, memory making good time!” Tishman said. Limo Cycle Tours is located at 303 W 3rd St, #4, Sanford, Florida. For more information, visit www.limocycle.com or phone 855-756-9FUN. 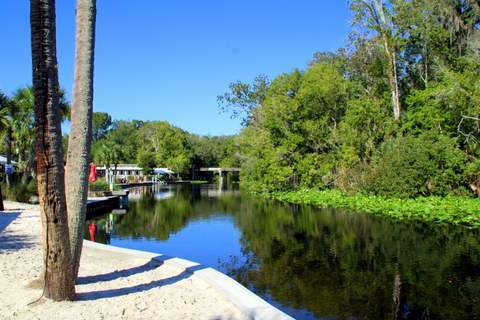 Seminole County or Orlando North offers a wide variety of quality food, fun and entertainment. Copyright 2017 Sunny Harbor Publishing.